When I was at the Farmers Market on Saturday buying the scallops for our Saturday night indulgence, I picked up a couple of oak smoked haddock fillets. These weren't your run of the mill, yellow smoked fish fillets - they were gorgeous, Scottish haddock fillets smoked over oak chips. I would love to be able to recommend the stall holder but I didn't get his name. But the haddock was amazing. With one of the fillets, I made home made fish fingers for Toots and Pip. Very easy - cut the fillet into "fingers" - because it it a butterfly cut, this is really easy. We had eight 'fingers'. We then dipped them in flour, egg then breadcrumbs. The girls liked getting involved. We then shallow fried them for about 4 or 5 minutes each side then served them with carrot sticks. They smelt amazing and next time, they are for the grown ups too ! Now, what did I do with the other one. I made a white risotto - onion, white wine, risotto rice, chicken stock... lots of stirring. Blanched baby leeks in lots of butter - slowly. Poached the haddock in milk with bay leaves and peppercorns. When cooked - added the leeks to the risotto - added a spoon of creme fraiche. 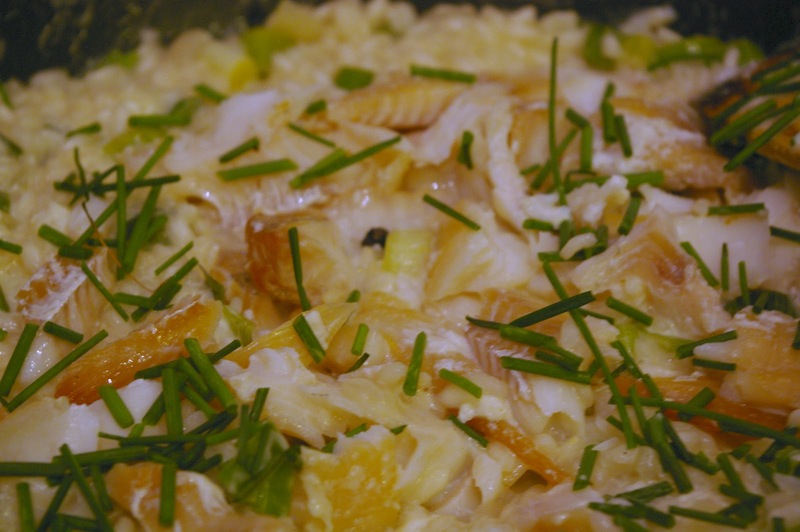 Flaked the haddock, added to the risotto with good serving of freshly cut chives. Aha I have found you!